The Comfort Hotel Vesterbro enjoys a prime location in Copenhagen's cool Vesterbro district, just 500 metres from Copenhagen Central Station. The city's many bars, restaurants and shops are just a stone's throw from the hotel. And WiFi access is completely free of charge. The Comfort Hotel Vesterbro is located on Vesterbrogade, in the ultra hip Vesterbro district of Copenhagen. Over the past few years, this area has been transformed since the 1960s and now has some of the nicest streets in the capital. The area is brimming with restaurants, bars, piazzas with al fresco dining and serious cool shops. Copenhagen's very own Meatpacking District, Kødbyen, has evicted the butchers and replaced their old shops with innovative galleries, creative art studios, organic cafés and popular clubs. But if you fancy something a little more traditional, tuck into Danish sausages and pastries, or visit popular classics, Tivoli and Stroget, just a few hundred metres from Comfort Hotel Vesterbro. Read more about Copenhagen here. Those of you travelling with a group of friends or a large family, may be interested in our XXL room with 8 beds. The room is nice and spacious (40 sqm) and features two bathrooms, both of which have have a bath tub. Please contact us to book this room by calling +45 3378 8050 or sending an email to booking.vesterbro@choice.dk. Relax with a glass of wine or a Danish beer in our hotel bar. If you're feeling hungry, the Plectrum restaurant serves a range of dishes from hamburgers and appetisers to delicious meat dishes and fresh salmon. 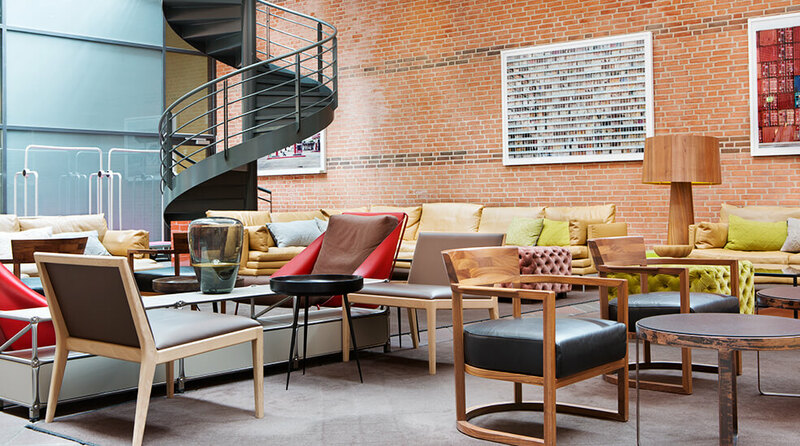 The Comfort Hotel Vesterbro is the perfect destination for conferences and events in Copenhagen. With its central location in cool Vesterbro, just a five minute walk from Copenhagen Central Station, getting here is really easy. We can arrange conferences, kick-offs and events for up to 125 people. At Comfort Hotels you always surf free of charge. And that's not all... On Sundays we let you keep your room until 6pm, at no extra cost. So, just relax and enjoy your stay! Take the airport bus to Malmo C, then the Oresund train to Copenhagen Central Station. 550 meters, a five minute walk. From Copenhagen Central Station you can take an airport shuttle bus or the Oresund train to Copenhagen Airport or Malmo Central Station.